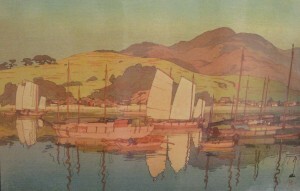 The mere suggestion of a minimal landscape, lack of perspective, linear brush strokes, and absence of shadows are characteristic of the Eastern, or Oriental, Art Style. This is part of the decorative tradition of a people who once made nature and Art a very important part of their daily lives. Since the backgrounds are so plain, compared to Western Art, this is an extremely GREAT Packet for teaching FOCAL POINT, CENTER OF INTEREST, or Emphasis. Be sure to asks kids, “What is the most important thing you see in this picture?” because the answers are obvious in most of this artwork. Be sure they understand the definition of the various vocabularies for this basic principle. White birds Flying in Snow has a minimum of PERSPECTIVE—SIZE (FOREGROUND bird is largest, birds grow progressively smaller towards top of picture), PLACEMENT (foreground bird lower in picture, background bird higher), DETAIL (more in foreground, less or none in distance). Sometimes COLOR (lightest in distance, brightest in foreground) is also used, but not here because the cranes are white. A Japanese artist does not model in light and shade for an illusion of depth as we do in the West. Because this style of art typically has little or no background, there is also often nothing of comparable size to help create a sense of depth. One of these pictures has no realistic Western sense of perspective—Kyosai’s tiger seems to float. Linear brush strokes are CONTOUR LINES or outlines, which are common in Oriental Style Art. One obscure theory about the reason for contour lines is that, because Japan is an island nation with a moist climate similar to ours here in the Northwest, darker outlines helped ancient pictures last longer as watercolors were leached out by the humidity. (So you could still see a picture, even when all the color was gone.) This theory is not widely accepted but it does make some sense. Western artists blend the edges of their painting subjects with shadow or highlight and create the realistic illusion of three-dimensions, or DEPTH, on a flat two-dimensional surface. Eastern artists use unaltered color, with outlines (similar to a coloring book), to create realistic but usually shallow (or flat) figures and scenes. This artistic choice has to do with visual taste and hundreds of years of ancient tradition. You might show the Japanese travel posters to introduce the Packet. Spend time discussing and comparing Oriental style dress. Share a few details about the Japanese culture. Point out Japan on a map or globe or have the kids point it out (talk ahead with teacher, who can introduce the geographic location a day or two ahead of your visit). People first settled in Japan about 20,000 years ago. By the 5th century AD, a state had grown up in the central area of Japan. This civilization traded with China and Korea. Legend tells that the very first Japanese Royal (or Imperial) family descended from an ancient Shinto goddess. In AD 710, the Japanese Emperor set up his capital at Nara, but in 794, it was moved to Kyoto. This was the official capital of Japan until 1868. From the 12th century, the Samurai, a class of warriors, began to take control of the country. Their leader was the Shogun. A Shogun’s power was similar to the combination of a General and a Provincial Lord. The Shogun was the real ruler of the country, although the emperor remained on the throne. In AD 1600, Tokugawa became the Shogun, after defeating his Samurai rivals. He moved the capital city of Japan to Edo, which is present day Tokyo. This powerful military government (called the Shogunate) ruled Japan throughout the Edo period, from 1615 until 1868. The ruling Shoguns for this long period were all descendants of Tokugawa’s family. The Edo period was a time of peace, prosperity and great artistic achievement in Japan. Many of the cultural traditions that developed during this time continue in Japan today. Japan shut itself off from the rest of the world, for more than 200 years. The Shogun leaders had adopted such a strong isolationist policy that by 1639, all foreigners except a small number of Dutch and Chinese were excluded; the Chinese were confined to the city of Nagasaki and the Dutch to their trading station on the artificial island of Deshima, in Nagasaki. The country did not approve of the type of influence that Europeans brought to a culture that had so many ancient traditions which had been followed for hundreds of years. The Japanese themselves were forbidden under penalty of death to travel abroad. Then, in 1853, the United States forced the Tokugawa Shogunate to renew contact with the West. On July 8, 1853, Japan was changed forever. U. S. President Millard Fillmore sent Commodore Matthew Perry to reopen Japan. Perry brought a fleet of four U.S. sail-and-steam warships into Edo (Tokyo) Bay. After Perry presented a letter from President Fillmore containing new foreign trade agreements, along with a strongly-worded letter of his own, the Commodore declared to all of Japan that the U.S. Navy would return the next year for their reply. Perry also stipulated that if the Shogun refused to accept these trade agreements, the U.S. Navy would respond with a larger force. He came back in 1854 with seven ships and held a series of talks with Japanese officials. On March 31, 1854, the Treaty of Kanagawa (which promised hospitality to foreigners) was signed. Two Japanese ports were opened to American ships. By the mid-19th century, Europe and America had gone through the Industrial Revolution, but Japan remained a medieval, feudal country that had changed little since the early 17th century. Samurai still wore two swords; their troops were still armed with spears and matchlock guns, copied from those first brought by the Portuguese in the mid-16th century. Worst of all, Japan had no coastal defenses at all, which left them very vulnerable to this new U.S. threat. Fifteen years after Commodore Perry’s first arrival (in 1853), Japan’s form of government changed again. Warriors loyal to the emperor led a successful revolt against the Tokugawa Shogunate. Emperor Meiji Mutsohito reestablished an Imperial government in Japan. He reigned from 1868 until 1912. Meiji was a man of great insight and ability. He carried out a series of essential administrative reforms that helped Japan become a modern, industrial nation almost overnight. It was one of the most rapid and dramatic transformations the world has ever seen. Ukiyo-e is a Japanese term, meaning “pictures of the floating world”, applied to the dominant movement in Japanese art from the 16th to 19th centuries. It refers to the subjects from everyday life, with its ever-shifting fashions, favored by printmakers at this time. These printed pictures depicted Geishas (beautiful women), theaters, restaurants, bathing houses, wrestling matches, and other recreational settings. Japanese prints began arriving in European ports in the 1850’s (Monet bought one in Le Havre, France in 1856). These prints greatly influenced avant-garde French artists, who felt their flat decorative color and expressive patterns were an influential inspiration. Traditional Japanese woodblock prints are a distinctly rich and evocative art form. 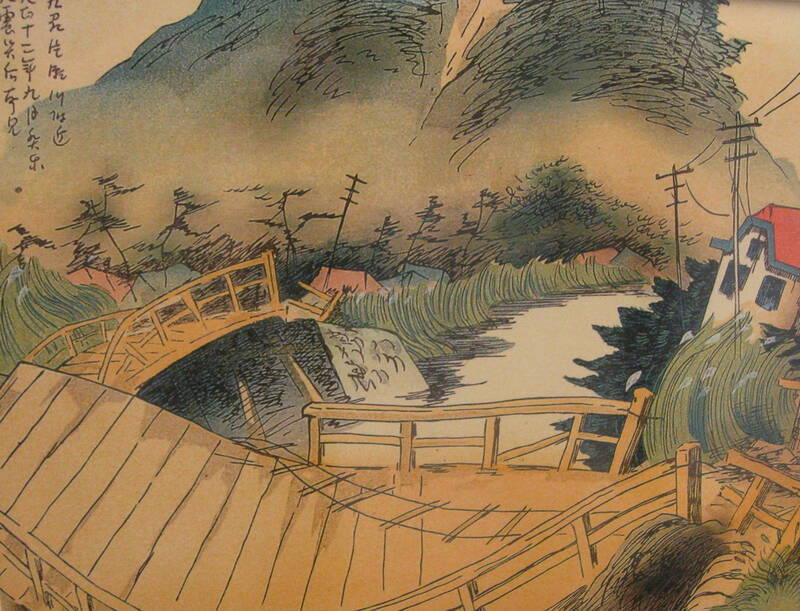 The fukeiga (foo kay ee ga) genre of woodblock prints focused on Landscapes. Created in part as a response to the shogun rulers’ restrictions on travel, fukeiga was often produced in sets as a travelogue. These vibrant prints enabled the Japanese and people around the world to see the life and landscape of this wondrous country. When viewing the luscious tones and delicate features of these prints, it is easy to forget that these painterly objects are produced by carving the image on wooden blocks, made of hard wood such as cherry, and striking multiple printings in various colors onto fine-textured, absorbent paper, handmade from the inner bark of the mulberry tree. The form is a blend of visual artistry and technical craftsmanship. Ukiyo-e artists produced their work by drawing a design on paper which was then pasted onto a piece of wood. The block was carved around the lines of the picture, very similar to a rubber stamp. For each color used in the picture, a different woodblock was carved. Two masters of ukiyo-e were Utagawa Hiroshige (1797-1858) and Katsushika Hokusai (1760-1849). Both artists are considered pioneers of fukeiga woodblocks. 1. “The Great Wave of Kanagawa” by Katsushika Hokusai, Woodcut (1831-1833). Between the 17th and the 19th centuries, Japanese artists developed a new form of artistic expression, woodblock prints that recorded the pleasures and amusements of everyday city life. Known as ukiyo-e, these printed pictures depicted theaters, restaurants, bathing houses, wrestling matches, and other recreational settings. One of the great masters of the form, Hokusai, was the first artist to introduce landscape as a theme for ukiyo-e prints. Hokusai had tremendous creative energy and his restless spirit led him to experiment with a variety of styles. He changed his name with every style change. Changing one’s name was a Japanese custom, but Hokusai carried it to an extreme—he changed his more than thirty nine times. No one is sure about the many name changes. Maybe he just craved variety, or was somewhat self-centered, or he just liked being different and a little eccentric. The name he kept longer than most was Hokusai, meaning “Star of the Northern Constellation,” in honor of a Buddhist god he especially revered. 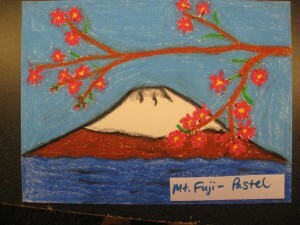 Hokusai seemed to also like variety in his place of residence. He was notorious for never cleaning his studio and took the easy way out whenever the place became too disgustingly dirty; he moved. He moved ninety-three times. This put a burden on his family and created a new set of neighbors at least once a year throughout his entire lifetime. He lived simply, usually in poor neighborhoods. Hokusai married twice and had seven children. Most of his children died in their twenties. The older Hokusai got, the harder he worked. He produced more than 10,000 woodcuts and as many as 40,000 drawings. He lived to the age of 89 and the inscription on his gravestone shows his final name Gwakio Rojin, which means “Old Man Mad about Drawing”. In 18th and 19th century Japan, this art medium (wood block printing) was very popular because many prints could be made from a single block, much faster than painting separate copies of a picture. This made the prints much more affordable than paintings. Hokusai’s use of LINE helps create a turbulent feeling of MOVEMENT and action in this print. Do you see more curved or straight lines? Curved—this is one technique that artists often use to create the feeling of movement in a picture. The curved lines create a sense of swirling movement. Notice how the lines in the print move our eyes in a sweeping clockwise circle, across the boats, up the wave, and back down again. Can you find the mountain? It is Mt. Fuji, a volcanic peak that is sacred to the Japanese and a major landmark of their natural Landscape, being the highest peak of the nation. By looking at the mountain, what season is shown here? Probably winter because the mountain is snow-covered. Although Fuji is covered with snow for most of the year, the snow disappears for a short time in the warmest part of the year. Are there any people in the scene? Help students spot the men huddled in their wooden fishing boats. Point out their round shaved heads and blue kimonos. Discuss their significance in the scene—nature seems more in control and much more powerful and than the tiny men are. What do you think would happen next if this picture were part of a moving movie scene? What area in this painting is peacefully still? Mt. Fuji’s stable, triangular shape creates a sense of calm in at the center of the picture. 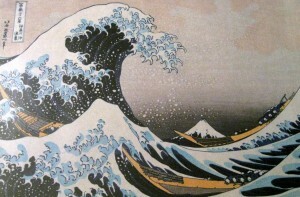 Are Hokusai’s waves realistic? Do natural waves really look like this? The waves are stylized. The artist has created decorative PATTERNS with the white caps of the waves, the LINES of the water, and the circular SHAPE of the heads in the boats. Hokusai has drawn the great wave as if it were alive, its many fingers reaching out to grab the small boats. What type of MOOD does the picture create? Menacing, a “hold your breath” moment, etc. 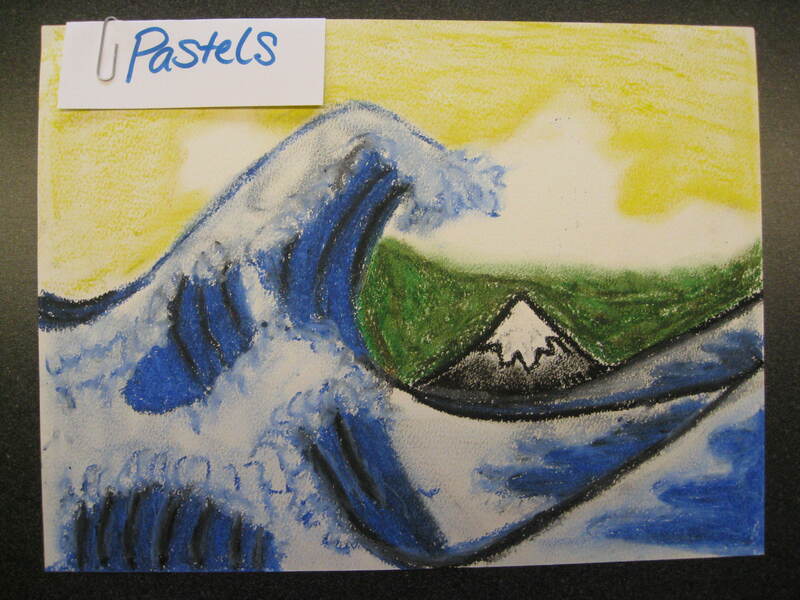 Create a drawing or painting of Mt. Fuji. Bring in a Seascape painting by Edward Hopper or Homer Winslow, two famous American artists, and compare the STYLE differences of these artists. Paint a Western Style Seascape, similar to the American artists. Find a book with additional Japanese Seascapes. Compare the differences in the Style of the artists. 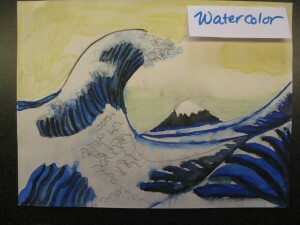 Create a Japanese Style Seascape. 2. 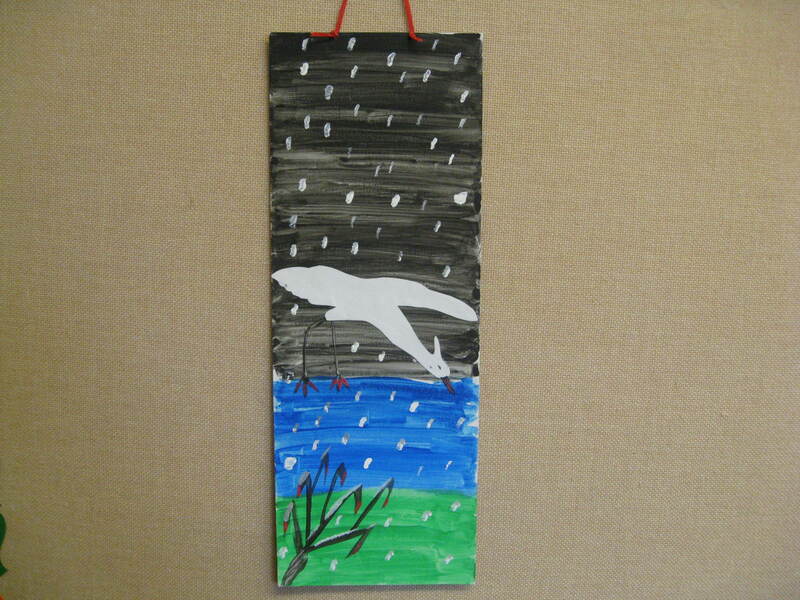 “White Birds Flying in the Snow,” by Shoson. Ohara Matao (1877-1945) was born at Kanazawa, Kage Province, in the country of Japan. He studied painting under Suzuki Kason, taught at the Tokyo School of Fine Art and served as advisor to the Tokyo National Museum. Under the guidance of Ernest Fenollosa, who was a professor of the Tokyo Art School, he made many great woodblock prints, specializing in flowers, birds and landscapes. While working for the publisher Daiko Kuwa, Shoson made designs for color prints of flowers and birds using the name Koson. In 1912, he left Daiko Kuwa and began producing original paintings under the name Shoson. In 1926, he returned to producing woodblock prints for the publisher Watanabe. These superior prints, based mainly on his personal sketches, found their way overseas. Shoson continued to produce beautiful and realistic prints, possibly using the name Hoson, until his death in 1945. In Japanese culture, the crane (Tsuru) is the symbol of long life and happiness. The crane is also a good luck symbol for a successful marriage, because cranes keep the same mate for their entire lives. The Japanese crane is called a “special natural monument” and the bird is considered sacred to many in Japan. Why did Shoson change his name so many times? See The Great Wave of Kanagawa by Katsushika Hokusai for an explanation of this tradition. What other names did he use? What COLORS do you see in this picture? White snowflakes fall across the grays and blues of the background, seeming light and airy in contrast to the solidity of the white birds. This is a subtle composition with quiet coloration. The artist has used more than one VALUE of the same color to make it appear as if there are more varities of color in the scene. Compare this picture with Winter. How are the snowflakes in this print the same/different? What else is the same/different? Snow covered branches similar—Different foreground and background—Winter has minimal detail but this picture has even less detail. How many cranes do you see? Why are the cranes so different in size? The biggest crane is the closest. The artist has used SIZE and PLACEMENT to create a sense of DEPTH or PERSPECTIVE in the scene. The bird that is highest in the picture is the smallest and appears to be farthest away. As your eyes move lower in the picture, each bird gets progressively larger. The fifth bird, with feathers, beak and feet carefully drawn, occupies the entire middle area of the woodcut and appears ready to light on a river or lake. Do you see anything else the artist did to create a sense of distance? Each crane descends vertically and each crane is painted in more detail than the one above it. Objects farther away have less detail than closer objects. The progressive sizes and increasing detail of each bird gives the feeling of distance in the picture. How did the artist create a sense of MOVEMENT in the picture? 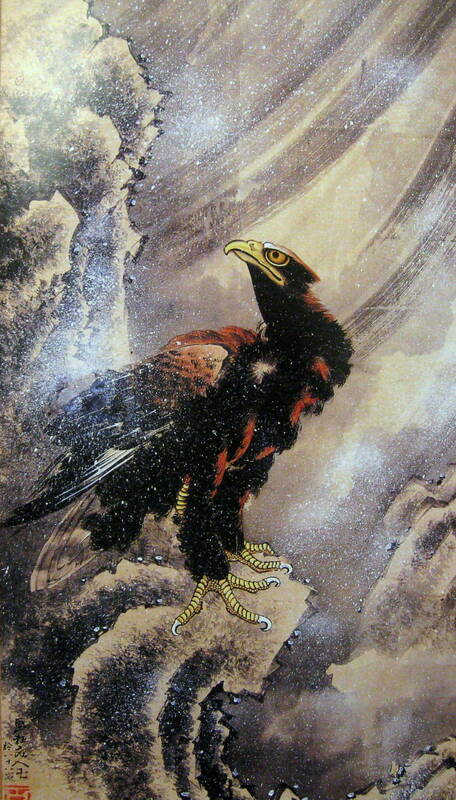 In a vertical composition, the artist gives us a feeling of movement with the curve and pose of each bird’s wings. The land is heavily covered with snow, indicated by the bent branches of a treetop, white against blue-green water. Most Landscape scenes are painted in a horizontal arrangement (wide and short). This unusual Landscape is arranged vertically (narrow and tall). This arrangement allows the artist to create the feeling of depth without needing to add much detail. What changes might the artist have made if he had designed this picture in a horizontal direction? The birds would have needed to be smaller, in order to create distance. The vertical composition makes it easier not to add many details. Horizontal arrangement would have had more space to fill on the sides, if the details of the picture (the cranes) were the same dimensions as the details in the vertical arrangement. Create a drawing or painting of a crane in a vertical composition on narrow paper, similar to the look of this print. Mount on black paper. Sculpt a crane with clay. Pay attention to the graceful curving SHAPE and MOVEMENT of the crane and recreate this feeling with three-dimensional curving FORM. (Grades 4-5) Create paper origami cranes. Kap and the Wicked Monkey, Norton, 1968. Especially recommended for K-2. This story is one example of the way cranes are used as characters in many Japanese Folktales. The Paper Crane, Molly Bang, 1985. Especially recommended for K-2. Magical animals in this story illustrate the theme of kindness rewarded. 3. “Winter” by Koryusai, (Circa 1764-1780). Isoda Masakatsu, professionally known as Koryusai, was born during the eighteenth century and died after 1788. He was a pupil of Shigenaga of the Ukiyo-e group in Tokyo. Koryusai made prints during the years 1770 to 1780, but once his success was established, he spent the remaining years of his life painting, since, as a Samurai (a member of a Japanese feudal warrior class practicing a chivalric code), he considered printmaking a vulgar (lacking cultivation or refinement) occupation. Koryusai contributed greatly to the development of the print as an art form. His woodblocks were done in simple colors, with design achieved through use of strong calligraphic lines. His figures move freely in space. He incorporated landscape details into his prints in a manner that demonstrates his skill in composition. Koryusai’s prints were unusually large and he was able to compose in a long, narrow format suitable for mounting on KAKEMONOS, or wall scrolls, for interior decoration. In his final style, he used a format of about sixteen inches in height by eleven inches in width, upon which he painted grandiose scenes in series of two or three prints to be used together. These frequently showed elaborately dressed women escorted by adolescents or children. Koryusai also made designs for folding ­fan papers and fashion plates and was responsible for the first truly individual portrait in the history of Japanese prints. This season has an atmosphere of fragility. The paper umbrella seems hardly strong enough to bear the weight of the snow that lies deep and icy upon it. The lady’s hands are cold and hidden in her flowing sleeves and her posture evokes the bitterness of winter against which she is huddled. The background landscape is indicated with great economy and skill. Color is delicate and white permeates the atmosphere. Can you see the snowflakes in the background and on the ground? The ground has dots of white that look like they were painted with a paintbrush and deliberately put in certain places. The background has paler spots that seem more random. These spots were created by watering down the white paint and splattering it on the painting. This project needs to be done in two parts. If you there are two volunteers, or the teacher is willing to help, one of you can oversee the background painting (outside preferably) and the other can send kids to work on their background, a few at a time. On a white paper background, draw and color a Portrait of someone dressed in clothes for snowy weather. Closely trim and cut out the finished portrait. Glue this to a blue, gray, tan or black background that has been spattered with thinned white paint, using a toothbrush or screening, to create the look of falling snow. Cut 4” x 9” piece of white paper. 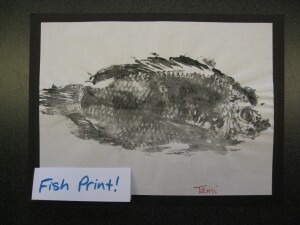 Use straw to quickly blow thinned black tempera paint (or ink) from the bottom of paper towards top. Slightly change positions, blowing vertical, diagonal and horizontal lines branching away from each other and off the paper. Paint (ink) will be absorbed quickly and stop moving, so blow hard and fast to create what looks like a tree branch. Wait 5 minutes to let this dry. Glue clear glitter along each line, to resemble ice. Center and attach to a 7” x 12” piece of black paper. 4. “Autumn” by Koryusai (Circa 1764-1780). Autumn is full of rain, falling in lightly indicated slanted sheets. The carefully painted KIMONO, with folds of moving material, expresses Koryusai’s keen interest in the fashion of the day. The line is extremely fine and detailed with exactness on the texture and design of fabric. The rain, leaves and landscape are very different. There is not much detail in the background, almost none at all. The rain clouds appear almost as if the artist accidentally spilled some thin paint on the background. This painting has a lyrical and poetic quality. This painting was created in the 1700’s, before modern materials like nylon and vinyl were created, which are used today to make umbrellas. This Japanese umbrella was made of paper. Would you like to walk in a heavy rainstorm with a paper umbrella like this? Do you think her shoes will keep her feet dry? a green palm. These are evergreen. We can also see a few Bamboo leaves near the ground. The background is minimal. Rain could happen in ANY season of the year, so we need the artist’s title to help us know that the season is autumn, or fall. (Positive/Negative SYMMETRICAL SHAPE project) If your school has a die-cut machine, check to see if it has an umbrella shape. Cut enough umbrellas from heavy paper so that everyone can have 3-4. Use masking tape to temporarily attach 3-4 umbrella shapes to a white piece of paper. Arrange the umbrella shapes in several different ways before you tape them down. A few arrangements to try—evenly spaced diagonal line, in a triangle or square arrangement (umbrellas at each corner), in an “x” arrangement (you will need 5), in a horizontal line, in two horizontal lines (you will need 6), in a vertical line down the center. Also, experiment with the distance between the stencils before taping them down. Put a small amount of blue and lavender tempera or acrylic paint in two separate spray bottles and dilute slightly with water (experiment to be sure the proportion of paint to water is right). Lay the papers on a large area of newspaper (outside if possible) and lightly spray in several areas with blue and lavender paint. BE SURE TO LIGHTLY SPRAY FROM ABOVE to avoid paint running under the stencils. (Allow first color to dry before spraying second.) After both colors dry, leave umbrellas attached to the background and use blue crayon to draw curved or zig zag lines, in a vertical direction, spaced approximately ½”- 1” apart, across the paper (and the stencil shapes). Lines should extend from the top of the page to the bottom and across umbrella shapes, in the same directions raindrops would fall on the umbrella. Remove umbrella shapes, which have now created NEGATIVE SPACE white umbrellas on your paper. Arrange the umbrella shapes (which have already been sprayed with paint and colored crayon lines) in the same arrangement on black background paper and glue down POSITIVE umbrella shapes. Glue both POSITIVE and NEGATIVE umbrella pictures to a larger background, side by side, so that they create one, larger, symmetrical picture. Create a NEGATIVE/POSITIVE project similar to the one above, except use leaf shapes and WARM (red, yellow, and orange) and brown colors of autumn (especially for grade 2). TINTS, SHADES and TONES can create a variety of COLOR VALUE for either autumn or spring leaf colors. Add small amounts of color to white to create various TINTS. Add very small amounts of black to a color to create various SHADES. TONES are created by adding gray to a color (especially for grade 4). In spring, use different VALUES of green. Different Values of green can be created by kids by adding yellow and blue to basic green. The INTERMEDIATE COLORS of yellow-green and blue-green can be added to basic green and blue to create an ANALOGOUS COLOR SCHEME for this POSITIVE/NEGATIVE SPACE leaf project (especially for grade 3). A Japanese farmer hat, used to shade hot sun from the eyes while working in the fields, can be also made with an 18” circle, when cut and overlapped in the same way. Younger kids will enjoy painting various SHAPES and PATTERNS on the hat to decorate it. Tape yarn or string inside the hat, on either side. These hats were invented long before elastic and were always tied on the head. If the hat needed to be removed for a short time, it could be left tied and the hat could be slid behind the shoulders. Younger kids (K-1) will have fun decorating and wearing this unusual style of hat. Encourage kids to go home and teach their parents about their Japanese farmer hats. For some extra fun, if you can find them in a party store, bring in small paper umbrellas for everyone. The umbrellas can also be found through carnival prize catalogues. They are inexpensive, costing only a few cents each. Be careful, most of these small umbrellas have pointed tips you will need to cut off with scissors for younger kids. Warn kids ahead that these paper umbrellas are fragile and they might last long enough to be taken home—maybe! As practical as it is handsome, the Japanese umbrella (wa-gasa) is a marvel of ingenuity and craftsmanship. Originally these umbrellas were painted with scenes from nature but they are not always decorated today. Japanese inns still provide them for their guests when it rains, and a few are sold as tourist souvenirs, but otherwise they have largely disappeared. Making the umbrellas requires a great deal of skilled handwork and the high cost of labor in Japan today makes this impractical when Western-style cloth covered, metal-framed umbrellas can be turned out by the tens of thousands using modern machinery. Western-style umbrellas were called Komori-gasa (bat umbrella) because their black cloth and metal-rib construction reminded the Japanese of bats’ wings. There are two basic types of Japanese paper umbrella. The bangasa (“number umbrella” because it had a shop’s name and address on it, as those used at inns still do today) was cheaper, with a rustic bamboo handle and natural (yellowish) color oiled paper. The Janome were more expensive and used only by women. They were larger in diameter, to keep an entire kimono dry. The bamboo handle was wrapped with rattan. The paper was dyed dark blue, brown or black, leaving a circular band of the natural yellowish white. The coloring and design of the Janome led to its name, which means “snake’s-eye”, the Japanese equivalent of our “bull’s-eye” design. Paper umbrellas used to be made all over Japan. The only craftsmen still producing them today live in Gifu City, near Nagoya, because the neighboring Mino area is still a source of good handmade paper. [Bring an umbrella into class and let the class count the number of ribs a typical Western-style umbrella has (8).] Umbrella ribs are the metal pieces that radiate from the center of the umbrella and are attached to the umbrella covering. The number of ribs for a Janome varies, but some have as many as forty. The split-bamboo ribs of Japanese paper umbrellas are hinged on cotton string. Your western umbrella is most likely hinged with metal, not string, which is probably more durable. Compare the 40 ribs of a Janome with the number of ribs your western style umbrella has. Compare the SHAPE of the modern umbrella you brought in with the SHAPE of the Janome in each print. 5. “Tiger” by Kawanabe Kyosai. Kawanabe Kyosai (1831-99) was a pupil of the printmaker Kuniyoshi. He was more influenced, however, by the work of Tohaku, a Kano artist of the sixteenth century who was the only artist of his period to paint screens entirely in ink on a delicate background of powdered gold. Kyosai, like Tohaku, was a master of the Chinese ink and brush painting technique, and like Kuniyoshi he was interested in the effects of gradations of tone and spatial arrangements. Very little is known of Kyosai except that he was best known for a lively spirit and was said to have lived a little bit of a wild and riotous life. What type of MOOD does this picture create? How does it make you feel? This lean and hungry tiger is stalking his prey. His yellow eyes gleam with ferocity and his pelt bristles with rage. Danger, fear, excitement, caution, panic all seem to come to mind. Does the picture make you want to hide in a safe place? Do you think the artist did a good job of creating a MOOD for this picture? Kyosai used watercolor and ink to create this picture. 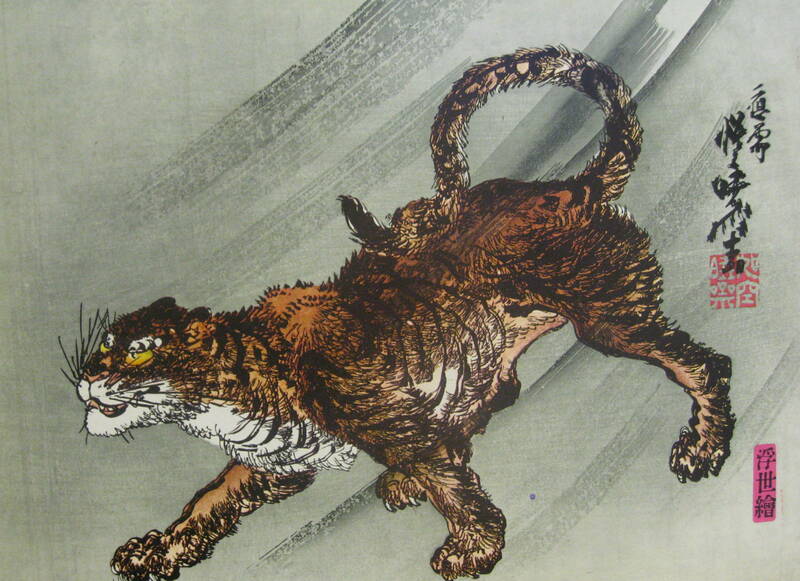 What colors did the artist use to make the tiger? His orange, black and white colors gleam against a contrasting pale gray background. How did the artist create MOVEMENT in the picture? The realism of this work is achieved by the use of Kano plunging perspective, by the brush stroke that gives the texture of bristling fur to the animal’s coat and by the sweeping curved background lines that add further movement to the beast’s angry stance. Compare the two oriental tigers to the tiger painting by the French Folk (self-trained) Artist, Henri Rousseau. What is similar? What is different? The background is especially different. Eastern or Oriental paintings have minimal background details compared to Rousseau’s extremely detailed full jungle background appearance. Create an oriental screen similar to one painted by Tohaku, the Kano artist, who was Kyosai’s inspiration (Remember—this artist painted screens entirely in ink on a delicate background of powdered gold.) Tape three 4” x 11” pieces of metallic gold cardstock (available in scrapbook section of craft store) together, in a hinged accordion style position. 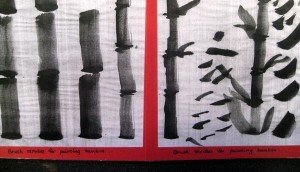 Use black marker to create nature designs (birds, animals, fish, flowers, trees, plants, insects, Mt. 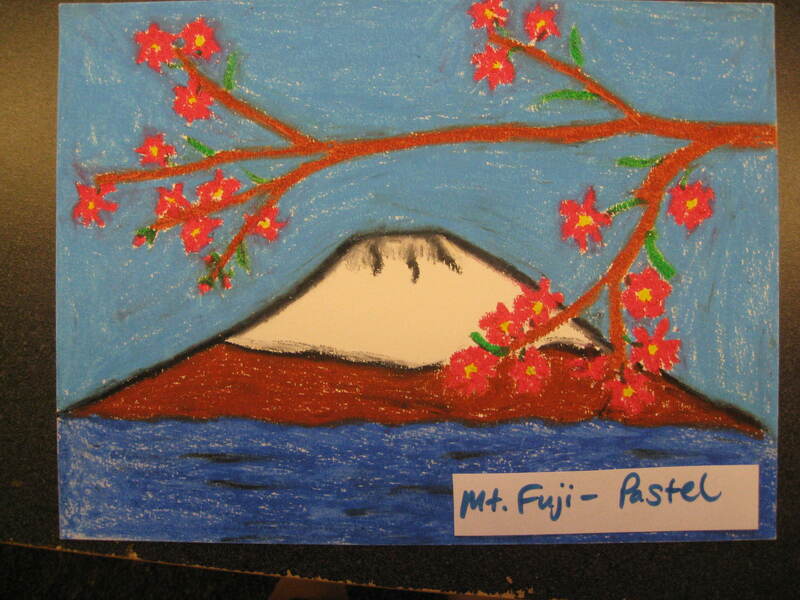 Fuji, etc.) and decorations on either side of each section. Write a Haiku poem and glue this to one side of the center. Use a pencil to draw a tiger with stripes on a white paper background. When you finish your drawing, go over the lines with black permanent marker (recommend fine line). You might also get permanent black ink in a bottle (from craft or stationary store) and paint ink over your pencil lines. Be careful not to smear ink. When ink drawing is finished, add pale watercolor to background and paint the tiger bright orange, leaving white areas to highlight his face, under his neck and his belly. One look at this painting will tell you it is by a Jap­anese artist! A first clue might be the calligraphic writing; but the theme and style of Tiger, by Ito-Jakuchu are even more revealing. Throughout the centuries, the favorite subjects of Japanese artists have been birds, beasts, blossoms, and bugs portrayed in a simple but powerful way that expresses the Japanese ideal of harmony with nature. 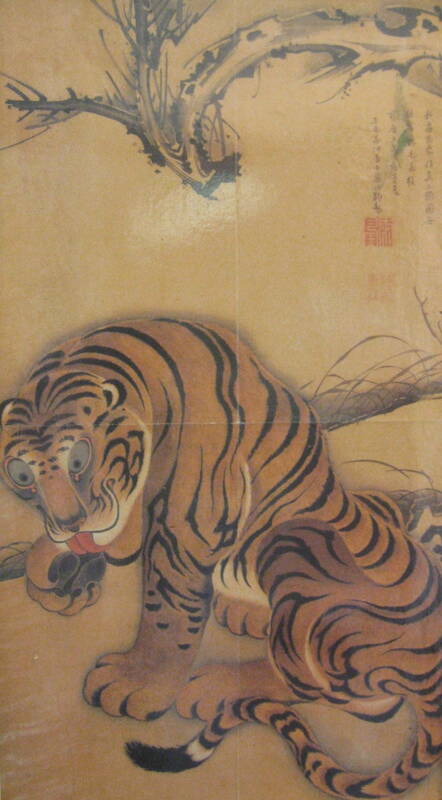 Jakuchu painted the tiger on silk as a wall scroll. The vertical format (similar to White Birds Flying in the Snow), the mere suggestion of a landscape, a lack of perspective, the linear brush strokes and absence of shadows are characteristic of the Eastern style of art, which was part of the decorative tradition of a people who feel that nature and art are a part of their daily lives. Begin by asking about the character of the tiger. Is he strong or weak? Serious or humorous? Friendly or unfriendly? Bold or shy? How can you tell? Look at his position and expression. Notice how the tiger almost fills the space as he preens and licks his paw. Do you see mostly curved or straight lines in the tiger? Trace the rounded shape of the body and some of the curved stripes that cover the tiger’s body. Look closely at the fine detail of the individual hairs of the tiger’s pelt made by an intricate network of cross-hatching. Can you find a diagonal type line? Point out edge of grass behind tiger How did the artist give the viewer an impression that this diagonal line is behind the tiger? Overlap—the tiger OVERLAPS the grass, we only see the grass on each side of the tiger. What is the main color of the painting? Look for shades and tints. Explain that the warm, monochromatic color makes the tiger dominant but still related to the background. Notice how the artist used red and white as accents. Focus next on TEXTURE. How would you describe the texture of this tiger? Compare the smooth, thick, furry coat with the whiskers, tongue, paws, and claws. Compare this tiger to the other tiger. Are the textures of the tigers the same or different? Describe the textures of the tree and grass? Repetition and composition add to the charm of the painting. What colors, shapes and lines are repeated? The U-shape of the muzzle travels to the tiger’s tail in a repeated PATTERN. The curving lines on the tiger’s forehead echo in the curving tree and grass. Younger kids can use black crayon or marker to draw repeated line designs on colored paper. Cut a tiger from the pattern and glue to a contrasting background color. 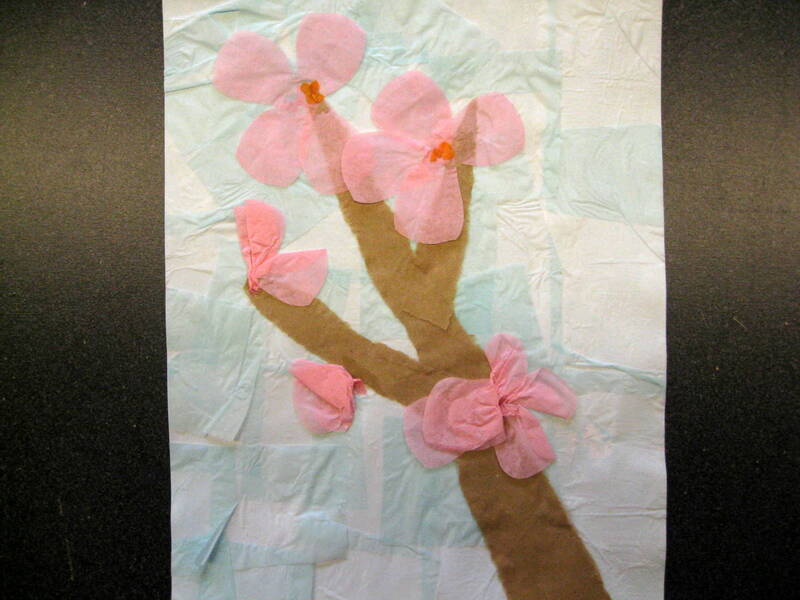 Make your own decorative wall scroll on large paper or material using a subject from nature. A Japanese Hanko, also referred to as a seal or a chop, has been considered a legal signature in Japan for more than 2,000 years. It can be affixed to checks, bills, legal documents, invoices, artwork and letters. The advantage of this seal is that it leaves a legible mark. There is no guesswork about the signature! Each person may have one or more chops. The most common place to see one is on Japanese artwork. Sometimes, you will see more than one hanko. There is a good reason for this. 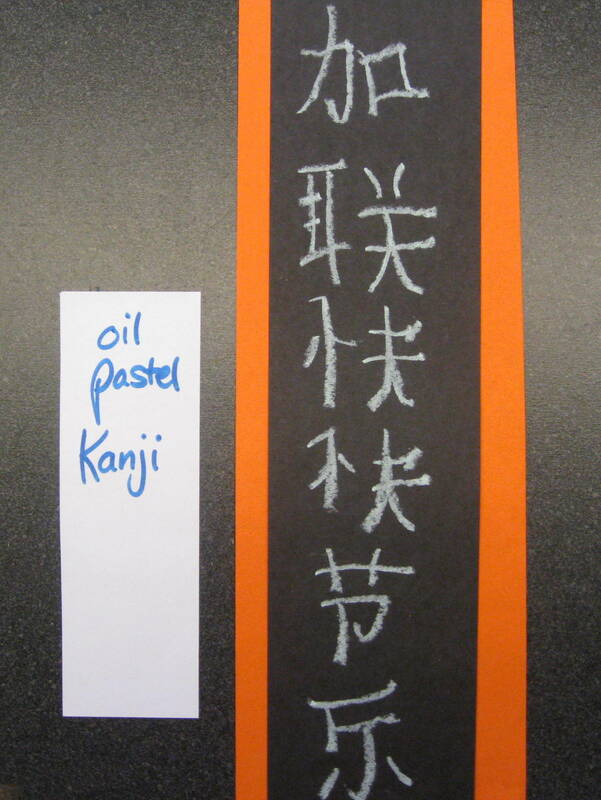 The artist affixes his hanko when he finishes a painting, usually using red ink. Artists also often add poetry to their paintings this way, which is done with black ink. Japanese writing is vertical, instead of horizontal, like English. Later, the buyer will affix his chop, or hanko, in black ink, showing their ownership of the art. All future buyers will each affix their own seal. In some cases, the artwork has become obliterated because of repeated “choppings”. The hanko and calligraphy are considered integral parts of oriental art. These seals (similar to a stamp) can be carved from wood, brass, jade, gold, copper, ivory, or soapstone. Each design is different. In the past, only an emperor was allowed to use a dragon design. However, all other designs are created in some unique pattern. A Hanko will vary in shape (oval, square, round, or rectangular), size, or color. Take time to examine the chops or seals found on some of the artwork. Bring in examples of other Japanese art and compare the various markings. Decide on a design and draw it on a small piece of craft foam (the kind with a sticky back). Affix your Hanko or chop design to a small (½” x ¾” to 1”) piece of wood (peel off the paper backing). Press your chop on an inkpad and then on your paper. Presto, you have your own Hanko! You can print your Hanko on your artwork with red ink. Use your Hanko wherever you want to use your name—on an artwork, a backpack, or anything else that belongs to you. Listen to “Classical Japanese Koto Music.” Explain that the music sounds different because it uses a five-tone (pentatonic) scale equivalent to playing just black keys on the piano. Invite students to contrast this with the eight-tone western scale. Compare movements for a tiger hunting, stalking, crouching, and lunging—to languorous resting. Act out each movement with younger kids. Create a movement composition with 16 counts for the tiger hunting, eight counts for resting, etc. Use nature as the subject for a Japanese haiku. Illustrate with a water color wash.
Read The Painter and the Wild Swan by Claude Clemente (Dial Press, NY, 1986) for how a Japanese artist captures beauty. The Magic Listening Cup by Yoshiko Uchida (Harcourt, Brace & World, NY, 1955) retells folk tales. Design your own seal. Cut into stencil, potato or linoleum block for printing. Experiment with calligraphy using large brushes and newsprint. Use a “squish and push” technique. Explore the Japanese art forms of origami, ikebana or bonsai. Mingei (Japanese Folk Art) items are very popular with modern day collectors. Another folk art, Kasuri, produced dyed decorative patterns on cotton fabric. Use small squares of cotton or muslin and paint to create small swatches of kasuri with decorative PATTERN. 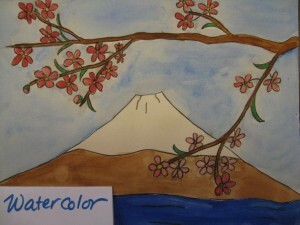 (5th grade) Paint a scene using the suiboku-ga technique. These are monochrome India ink paintings of nature. The contents of the scene might include rocks, buildings, people, trees, and/or mountains. Although the scene has a sense of depth, no one object becomes a FOCAL POINT because everything in the picture is given equal emphasis. An example would be a village scene with people. All the buildings would be similar in size and color value, as well as all of the people. Neither the people nor the buildings would capture the viewer’s attention. This lack of a focal point makes these paintings unique. Mountainsides are shown in various intensities or VALUES to create hieght, depth, and a sense of distance or closeness. This use of dark and light creates the perspective (or depth) in these scenes. Use three small containers to prepare the ink for this project. The darkest value is small amount of straight ink. Adding small amounts of water to the containers creates the light and medium values. Use like paint creating outlines filled in with lighter value grays. Mount the completed picture against colorful matting. 7. “Shio machi (Waiting for the Tide)” from the series “Seto Naikai (Inland Sea)” 1930 by Yoshida Hiroshi (1876-1950). Color woodblock print. 10 7/8 x 16 inches. The Portland Art Museum, just across the river from Vancouver, Washington, has more than 2,500 Japanese prints in its permanent collection. The museum put together an exhibition of prints that date from the 1800’s to the present, and then the museum published a book about the exhibit. “Waiting for the Tide” was selected to be in this exhibit and in the book as well. 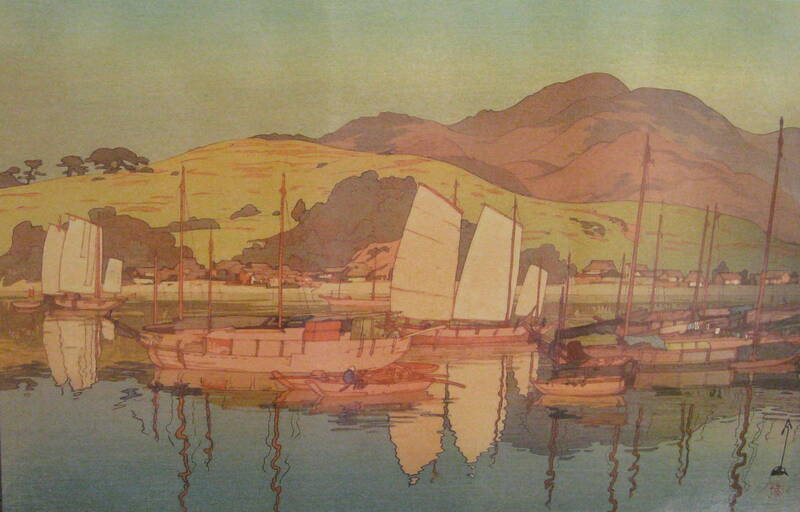 “Waiting for the Tide” is the title of this print by Yoshida Hiroshi. Yoshida was trained as a painter first and then later became fascinated by making woodblock prints after he was already an accomplished artist. Compare this work to a print in this packet from the 1800’s: does “Waiting for the Tide” look more like it was painted, even though it is a print? Yes, the color and the shading are more complicated and realistic than most of the earlier woodblock prints. What other things might make you think this art work is from the 1900’s and not the 1800’s? There is more variety of color used. The art is more realistic in some ways as the artist has used perspective in the art work – the houses and trees in the distance are smaller than the boats. The boats further away are smaller than the ones closer to us. There is writing on the left side of the image. What do you think the characters say in the margin? Yoshida printed the date, series title and the title of the print. 1. Draw a boat on calm water and show the boat and the landscape reflected in the surface of the lake or harbor. 2. Cut out a boat (and trees and houses if time allows) using craft foam and glue to a paper plate or flat piece of board. Using paint or markers, cover your boat or your scene and press paper over the top to make a print. Many prints may be made from one “block” or scene that is created. 3. Paint a watercolor scene using “Waiting for the Tide” as inspiration. Students might create their own idea of this same scene, or paint a more modern version of a harbor they might have seen. For more information: The Artist’s Touch, The Craftsman’s Hand: Three Centuries of Japanese Prints from the Portland Art Museum, Maribeth Graybill, editor. 8. “Seen near the Katase River in the Kugenuma District, after the Great Kanto Earthquake Disaster of September 1923” by Oda Kancho (Japanese, 1889-1961) 1924. Color Woodblock print. Kancho lived in Katase, Kanagawa Prefecture, to the Southwest of Tokyo. He was a well-known Nihonga painter and participated in virtually every government-sponsored exhibition from 1915 to 1943. All the scenes that he contributed to the Earthquake series are from area near his home. His captions document the time at which he made his original sketches. Kugenuma is a suburb of Fujisawa, on the Katase River. In this print you can see that the force of the earthquake is so strong that it is bending and distorting even something as large as a bridge! In the background, the pine trees, the grasses, the poles and the house – and even the mountains – seem to all sway with the movement of the ground. Why do you think the artist wanted to make a print of this scene? Many artists make art works of scenes that are familiar to them, and sometimes if there is an important event, such as this earthquake, it is important to make art works that document these events. Making an art work can also help you to understand an event that has happened. Many artists have made art works that help them to express how something they have seen has affected them. Draw or paint a picture of somewhere you know very well. Draw the picture to document what the place looks like, or how you felt when you were there. Was the wind blowing? Can you make the trees or grass or flowers look like they are blowing in the wind? It is the small details that will make someone looking at your picture know exactly where you are if they have been there, too. Have you ever seen an amazing event, whether it was an earthquake or a birthday part, a concert, a school play, or a really great memory during school or recess? Draw a picture of this event to record it in history. 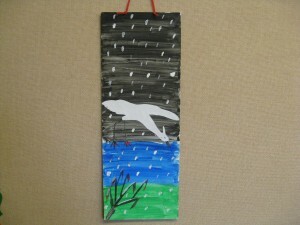 Make a drawing or painting showing an animal in a storm. Can you show the power of nature and the movement of wind and rain? It is challenging: practice by sketching the swooping lines of rain in the wind. It takes many lines to show many raindrops! If you have younger students that might not be able to draw an entire animal: consider a drawing with just the animal’s face in a tree, hiding in the grass or inside a hole in a tree –or maybe just the eyes glowing in the dark. For an art work in the night-time, use black paper with oil pastels or chalk. 10. 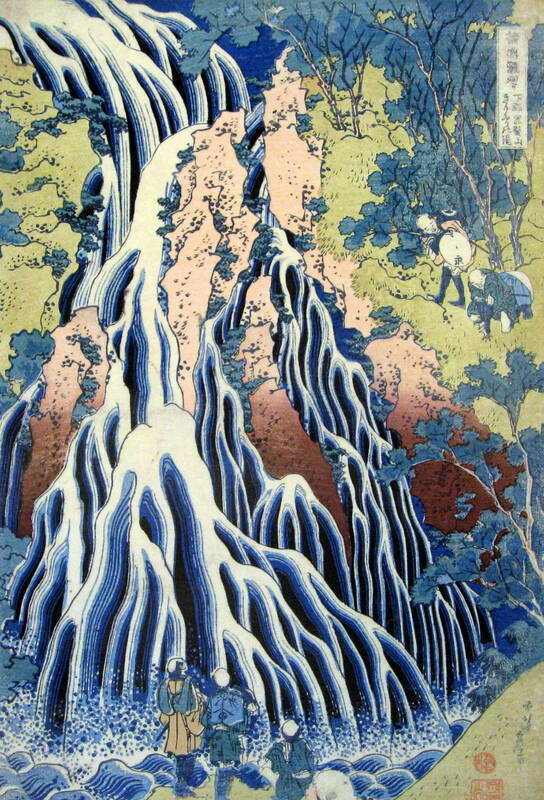 “The Falling Mist Waterfall at Mount Kurokami in Shimotsuke Province” by Katsushika Hokusai (1760-1849) from the series A Tour of Waterfalls Around the Country 1833-34. Color woodblock print. This stylized waterfall has a very flat aspect and only a small attempt at depth and perspective – yet it is appealing and relaxing because of the subject, color and mood. Why do you think the artist wanted to make a print of this scene? 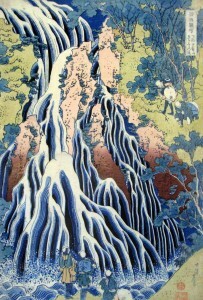 Hokusai made a series of prints of waterfalls. Since customers sometimes bought and collected a series of prints – this was a smart idea! Draw water in movement – a stream or a waterfall. It can be a place the student knows, or you may bring in photos of waterfalls. Show a photo of Multnomah Falls, or another waterfall on the screen in the classroom for the students to sketch or be inspired by. *Make sure the students notice the actual colors of the water. Is all water blue? 11. “Fuji from the Mountains of Isu” by Utagawa (or Ando) Hiroshige (1797-1858) (or in another translation “The Izu Mountains”). From the series “36 Views of Mt. Fuji” 1858. 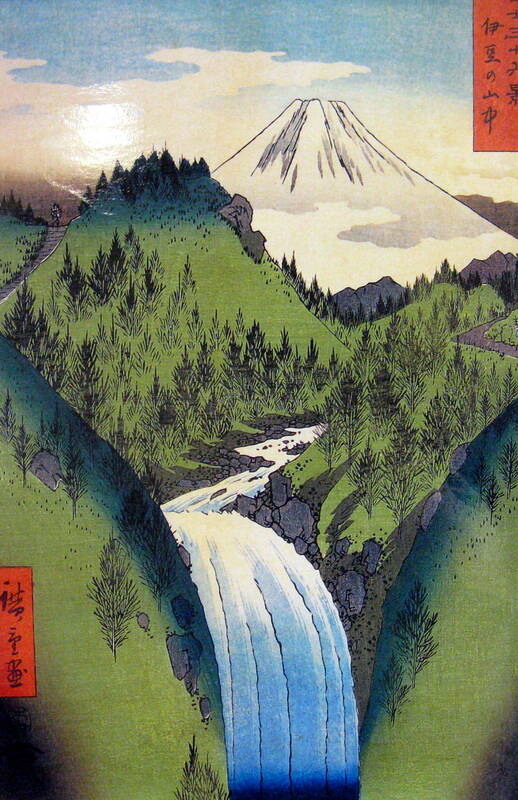 *Compare this to “The Falling Mist” waterfall print by Hokusai. How are they different and how are they the same? Since these titles are translated, they can be translated slightly differently each time. This makes things interesting for the Art Historians. 13. “The Wave” by Utagawa (or Ando) Hiroshige (1797-1858) from the series “100 View of the Provinces” Published 1859. Color woodblock print. 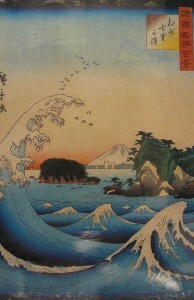 This art work was published after Hiroshige had already died.